Frugality is so ingrained into our lifestyle that it would be difficult for us NOT to be frugal… but I’m a great believer in practicing sensible frugality… and that doesn’t mean deprivation, being miserly or feeling cheap. 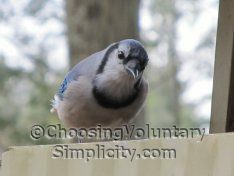 I sometimes think that Choosing Voluntary Simplicity started itself… beginning with the drastic lifestyle change my husband and I made nearly twenty years ago. I have trouble buying into the idea that everything that happens to you in your life is the result of choices you have made… and that with properly-focused thoughts you can control your life, your success, your health, and your future. Downshifting means working towards simple living by making conscious choices to leave materialism behind and move on to a more sustainable lifestyle. It does not mean simply cutting back and trying to live the same life only with less money. I think the most wonderful thing about voluntary simplicity is that it means different things to different people. There is no one way to do simple living right. Frugality comes naturally to native New Englanders, I think, and most of us already have a strong streak of individuality and an inclination to do things just a little bit differently than the rest of the world.